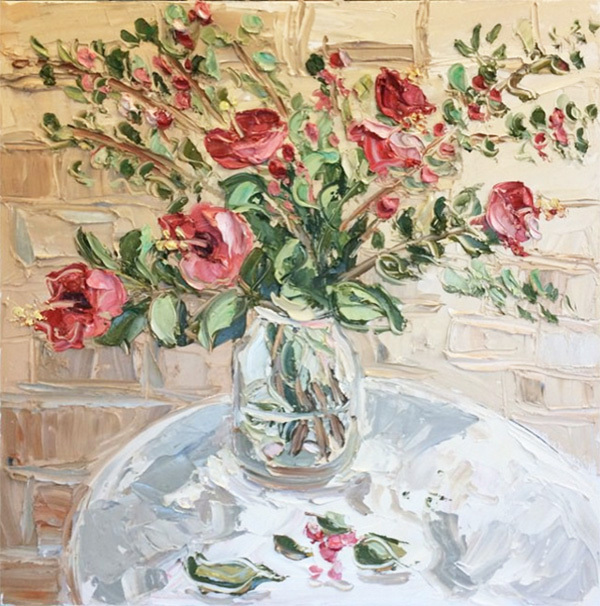 It is such a treat to feature Australian artist Sally West on the blog today. I love Sally’s stunning beachscapes and unique, textured approach to painting. You’ll find that her artwork has a special warmth to it, which Sally attributes to the lighting and sunshine in Australia. She has exhibited all over the world since her first showing in 1998, and has been awarded several honors along the way. I had a great time interviewing Sally and learning more about her creative inspiration and surprising painting technique. 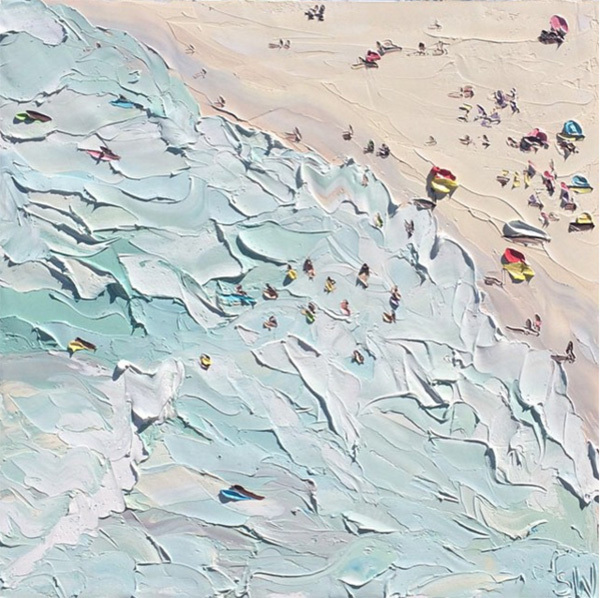 “Beach 2 – Plein Air”, Oil on canvas, Sally West (2015). Jacquin: I love your use of thick brush strokes in your paintings. There are so many layers to your artwork with your textured approach. It’s really spectacular! How did you develop your aesthetic as an artist? Sally:I used to live in the country. It was beautiful. There was so much wildlife and I had a little cottage/studio to myself. I never felt lonely because I had painting. I had paintbrushes and limited access to supplies. Over time the brushes became stiff and a bit like working with stumps. I found an old palette knife lying around and figured it would tide me over until I got new brushes. I have never used a brush since and my paint application has become thicker probably because it’s just so much easier to load paint onto the palette knife. “Mum’s Birthday”, Oil on canvas, Sally West. Jacquin: What is an average day like for you? Sally:I get my kids to school. I either collect flowers or buy flowers, then go to the studio to start painting them. Sometimes I drive around and take shots of street scenes, which I also like to paint. If I’m going plein air painting, I pack the car when I get to the studio, drive somewhere (after stopping along the way for coffee), arrive and then setup for painting. Then I paint. Afterward I wrestle my wet canvas into car, pack up, drive back to studio, wrestle wet canvas into studio, unload gear, go home, shower, pick up kids, feed them, put them to bed and then have a drink! periods of time indoors and it’s not realistic to paint outside everyday. Jacquin: What’s in your tool box? Do you have any favorite or especially useful tools right now? Sally: I love my Leatherman. Apart from all my paints and painting gear, it is the one thing I take everywhere. It holds almost everything you would carry in a toolbox. I use the Leatherman’s players, saw, screwdriver, and nearly everything on it everytime I go out painting. The other thing that I definitely cannot live without is baby wipes! I use about a packet per painting to wipe the palette knife clean before applying a new colour, it keeps each stroke clean and prevents muddying the colours. 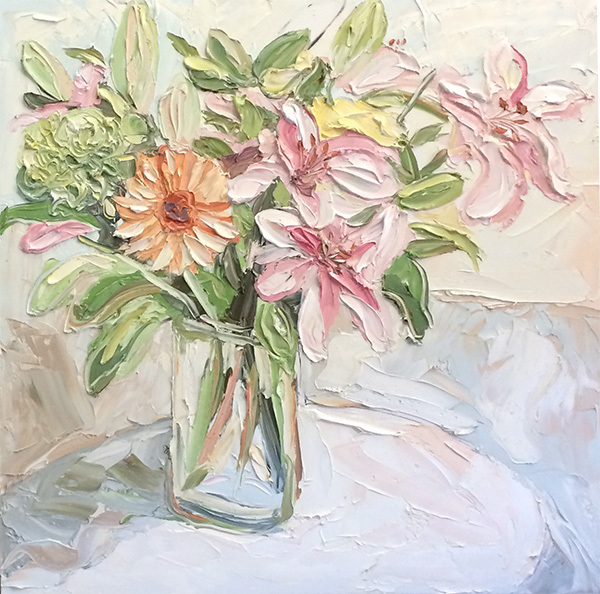 “Highview Road Flowers in the Olive Jar”, Oil on canvas, Sally West. 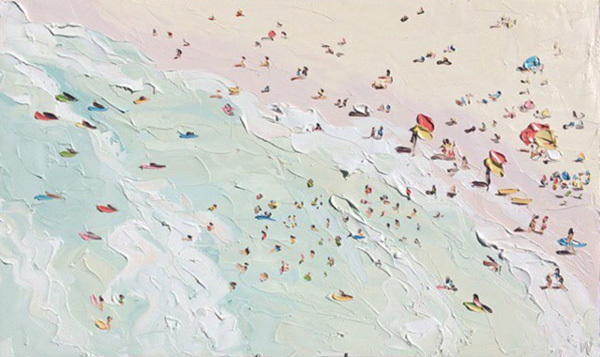 “The Beach – Plein Air”, Oil on Canvas, Sally West (2015). Jacquin: What advice would you give to a developing artist? Sally: There is no other way to develop in my mind, apart from just painting. The more you paint the more you learn through the actual experience. I don’t believe you get that from a classroom. Jacquin: How does life in Australia influence your work? Sally: Australian life is about the outdoors. A lot of my work is painted outside. I love nothing more than standing out in the elements and responding to the environment. The colours and light of Australia are obvious in all my work. 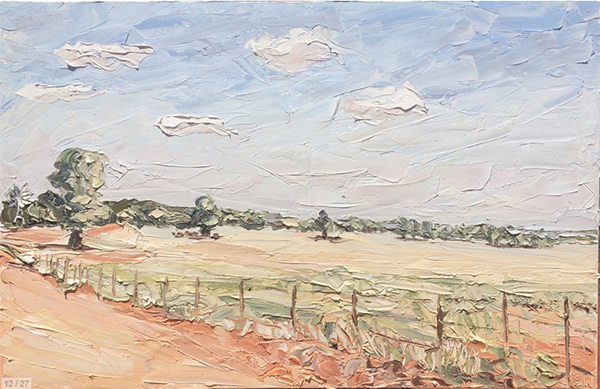 “The Windmill – Plein Air”, Oil on Canvas, Sally West. FINALIST 2015 Outback Art Prize. 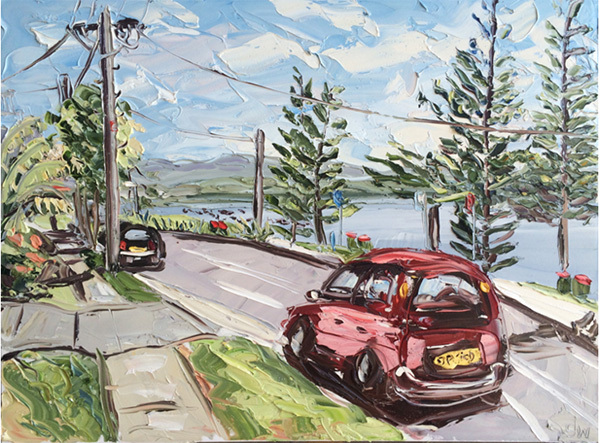 “Tuggerah Parade – Plein Air”, Oil on canvas, Sally West. FINALIST 2015 Warringah Art Prize. Jacquin: What has been your most memorable moment as an artist so far? Sally: That’s such a tough question. Probably the first time I won an art prize. I have won a few since, but that first one was important in building my confidence and helping me to believe I really was on the right path. Another time was the first time I went plein air painting. An artist friend convinced me to go with her and another lady. I took all my painting gear in my little rundown car and drove up the side of a mountain in order to see down the Australian coast. I remember sitting on the grass after we’d finished painting, discussing our works. It was beautiful. I remember thinking, why haven’t I done this before! I never looked back. “Fresh Water Beach – Plein Air”, Oil on canvas, Sally West (2014). Learn more about Sally West’s original artwork on her website or follow Sally on Instagram. 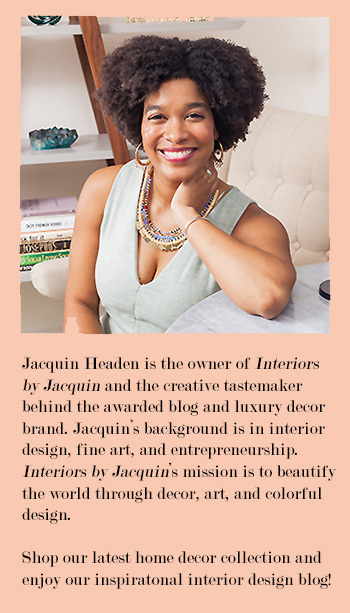 I am introducing a NEW “Art” page on Interiors by Jacquin blog. You can access all of the previous Artist Spotlight features through the new “Art” tab located at the very top of the page or click here. Go enjoy some artwork today!